We’re in undiscovered country now. With the rotation of Theros block and M15, Magic players now find their collection slightly less viable for the long term. In the past we’d have another year with our previous fall set, but with Battle for Zendikar, our time is cut much shorter. We’re looking at another 4 months or so before Khans of Tarkir and Fate Reforged rotate out with the release of the spring set. The sets will have had 18 and 16 months respectively in standard before saying good bye, and that time frame is only set to get shorter with our future sets. Dragons of Tarkir and Origins will rotate out next fall, and after that we only get 5-6 sets of cards in standard at any one time. There will be less spikes/lulls in value – we could possibly be looking at a environment where a card like Jace, Vryn’s Prodigy is in a perpetual state of value. It could be that the one time to pick up a multi-format all star was at the end of the 2nd month when that set was being opened. That’s when the maximum amount of people are opening packs and the largest number of any said card are in circulation. The quantity of cards will be affected – Once a new set comes out, those popular cards/staples are opened less and become much, much rarer. Of course this means a higher price, but also that you might not even see these cards for sale for weeks on end due to their popularity. The window for selling/buying will be much shorter – For other cards that see play only in standard, we could see a card have a high value for 1-2 sets then fall off afterwards and never regain its highest value from those first few seasons. In these cases, you’re better off selling sooner than later. For example, it’s better to sell Khans cards now that won’t see play outside of standard and to pick up those that will. When we finally start the new 14 month rotation system, your window for either of these will have gone from 14 months all the way down to 10 months (less than a year). Of course this has been Wizard’s plan all along. We buy a bunch of cards when a set comes out, then when the value of the set has been pushed up again due to a few chase cards people start opening up those packs in large quantities again. 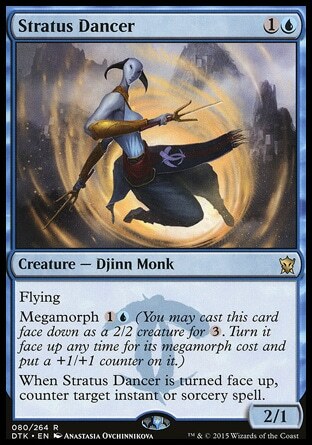 The difference between now and before is that sets like Born of the Gods or Dragon’s Maze had only one big chase card (Brimaz and Voice of Resurgence) and the overall set was weak compared to the recently evolved metagame that can support multiple bombs/chase cards in standard instead of just one or two. With cards that are better designed and more desirable, we’re going to be looking at periods of high demand of staples with very little time for them to drop in value during each subsequent release. Basically we’ll have to spend more to remain competitive than before, or just focus on a few colors to make our decks more adaptable to changing metagames. I’ll be using this reasoning from here on out when I do my investment articles, and it would probably serve you well to think the same when you’re considering when to sell or buy a card. Luckily this new financial environment is a double edge sword. Yes we’ll have to pay more for some cards, but on the opposite end cards we invest in early should appreciate well and make you more money than in past seasons. Anafenza, Kin Tree Spirit – I thought she’d see more play than just White devotion, but the Hardened Scales deck with her hasn’t taken off as much as I thought it would. Still a chance, but bad call last time by me to get her at $2. Only $1 now. Hidden Dragonslayer – I’m rather surprised that I was right on this one. He was a longshot, but the Dragonslayer is up from $1 to $1.50, so I was correct in assuming he’d be good against Eldrazi. He also fits well in the GW megamorph decks out there. Mastery of the Unseen – thought it would see more sideboard play but it hasn’t moved at all from it’s previous price. Another misjudgment. Monastery Mentor – I said to pick him up at $15 cause I saw it to be his lowest and so far I’m right. He’s back up to around $16.25 right now, and only bound to go higher as we get farther away from Fate Reforged. Secure the Wastes – it’s moved slightly from $2.25 to $2.50, but I think there is still a lot of movement left in it once BFZ standard really gets underway. Wingmate Roc – Another good call on my part. I said to get in on them at $3 last time, and they are already at $5 thanks to some moderate play. Soulfire Grand Master – Another card that’s up slightly, but it could go up even more if it can find a home in one of the decks in standard. Icefall Regent – it’s seen some play in Dragon and a few Temur decks, but not enough to chance its price from last time. Still $1.50 so I was wrong. Monastery Siege/Torrent Elemental/Clever Impersonator – These were all my bulk rare picks that I thought had the best chance of going up after rotation. The siege is up from $.50 to almost $1 now, and the Clever Impersonator is up .50 to $2.50 now so they weren’t bad buys if you picked them up earlier. Only Torrent Elemental remains unchanged at $1. Bloodsoaked Champion – Champion has made a small gain since last time and it at $2 now, up from $1.75. It has a chance to see a lot more play I think. Brutal Hordechief – he lost money actually. Went down to $2.25 from $2.75. Bad call on my part. I thought the reduction of removal would make it easier for him to function in standard. Grim Haruspex – no movement from $.50 yet, but I’ve seen him/her showing up a lot in Aristocrat/Rally decks post rotation which means there’s a chance it can still break out. Thoughtseize/Tasigur – I recommended both of these at $23 and $8 respectively and they’ve both dropped in value a bit since last time, but their long term prospects still look really good. Being hours away from the standard portion of the Pro Tour, there is still a chance we’ll see a few of the cards I chose break out so don’t forget about some of these choices down the road. There is still potential there. I don’t think we’ve seen the last of Hidden Dragonslayer ($1.50). He plays well in GW Megamorph decks and with dragons AND Eldrazi to worry about now, I think his price will inch up over the next few months before Oath of the Gatewatch comes out. I could see this card becoming $3 on the back of white based aggro decks doing well. I believe $6-7 is the lowest Kytheon (or lil’ Gid as I like to call him) will go. All this card needs to do is see play in a viable aggro deck and his price will shoot up to double digits again. I’m not saying he’ll go up for sure before the next set, but I am saying that it would be a good idea to grab 3 or 4 to sit on until that does happen. He still has about a year of play left in him and he’s bound to get good sooner or later. Monastery Mentor ($16.50) has even less time left in standard (another 4-5 months), and while he hasn’t shown up much in standard he does have a promising future in modern and legacy. 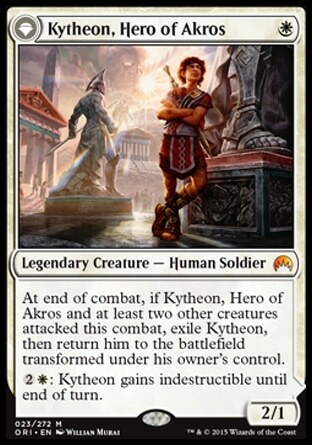 Being a mythic rare means that his price can easily jump to unaffordable levels if he becomes a staple in a popular deck. He used to be $30, and I think he could easily get back up to that price after he rotates out. His current price is a good entry point, so I’d grab a playset if you already haven’t. 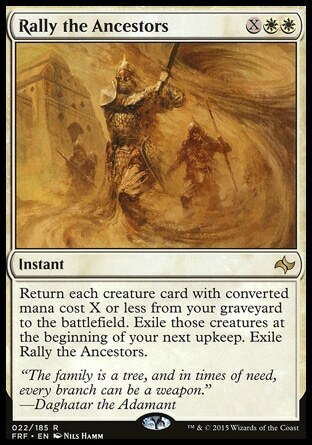 I said this before after Whip of Erebos rotated out, but Rally the Ancestors has a lot to gain in this new format. The new Aristocrat decks based around Zulaport Cutthroat can fill up graveyards quickly with Gather the Pack and other sacrifice outlets, and this deck could end up being a lot faster than those durdling control or 5 color midrange decks out there. Rally will be at least a 3 of, if not a full playset in these type of decks, so you can be sure that the current $1 price tag could easily triple to $3 in a matter of hours after a good performance at a major tournament. If you didn’t buy them before the last spike, grab a playset now before they go up again! 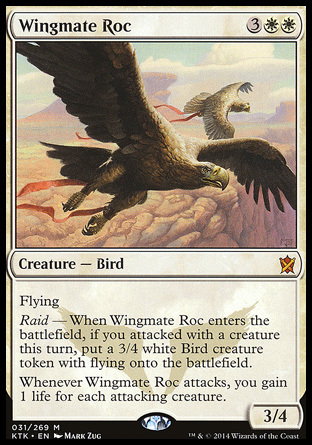 I was right last time that Roc would see more play, and I don’t think it’s even begun to “spread its wings” in standard yet. It works very well against cards like Mantis Rider in those dark Jeskai decks at the moment, and without Stormbreath Dragon in play it can a lot more work than before. It’s currently $5 but I think that’s under-priced. I believe it will go back up to around $8 before the next set release. I don’t think people will be looking for playsets, but this could quite possibly show up as 3 of’s in a few different decks like Mardu, RW aggro/midrange, and even some mono white builds alongside of Archangel of Tithes. There are a few bulk rares that I think could see more play and that I would grab playsets of while they’re low. I don’t think they’ll go up much, but it’s good to have them just in case. Mastery of the Unseen is only $.50 but works well in a variety of sideboards as well as in the GW megamorph deck, so it might save you money to grab them now before they triple or quadruple in value. Secure the Wastes is another card that might see a lot of play in control decks down the road, so keep an eye on it’s current $2.50 price. I don’t think it will go up much if it does see play, but better safe than sorry. My other pick is Tragic Arrogance ($1.50). I believe this card is much better than Crux of Fate or End Hostilities, and with both of those cards rotating out of standard in February, this could be the premier board wipe alongside Planar Outburst from BFZ. Wow, it’s really hard to guess what’s going to happen with blue. Blue is current the Jace show, and outside of that card there aren’t that many cards seeing play at rare and mythic rare. There are, however, a few cards that I think are underpriced at the moment and worth grabbing a few of for the future. 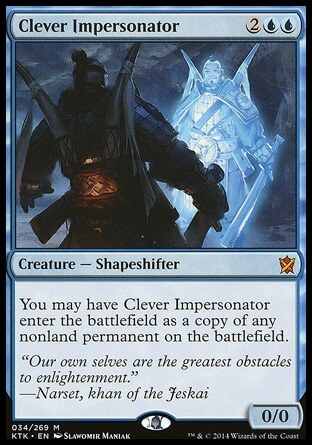 While I’ve never seen Clever Impersonator ($2.50) get any kind of play in a constructed format, I do believe that we could see it either in this season or the next. 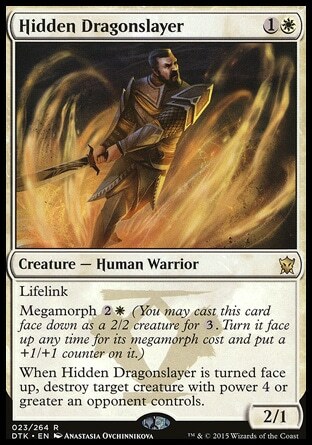 It has potential, but first we need to have a metagame where copying a permanent with a Phyrexian Metamorph type of ability is needed. Temur and Bant decks seem to have gotten a lot more weapons for this standard season, and who’s to say this won’t show up in a 5 color Bring to Light deck as Seige Rhino #5 and 6? It’s a longshot, but still not bad to invest in if you don’t have any. 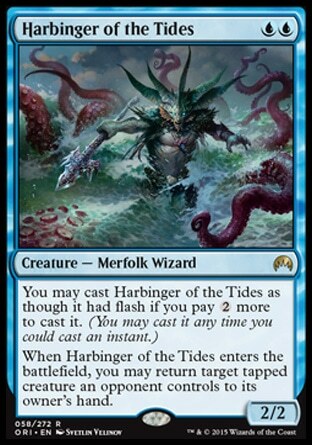 Another card with a lot of potential but not a lot of playtime is Harbinger of the Tides. It works great alongside Ojutai’s Command and is a great tempo swing when you play it during your opponent’s attack phase. It feels undervalued at $2. I would recommend a playset for future use if you don’t have it already. This could easily become a 4 of in a specific archetype and double the price. Might not happen this season, but it could happen soon. I’ve seen Stratus Dancer played in a few decks, namely Jeskai tempo or Bant versions of the GW megamorph deck and it’s pretty effective. I don’t think we’ll see much of it early in BFZ standard, but I wouldn’t be surprised if people started to slip it in to blue versions of power archetypes in order to get an edge on metagames ruled by the 2 color versions. It’s $1.50 and has some useful applications so it wouldn’t hurt to have a playset. There are quite a few cards that I think could see play over the next few months but they most likely won’t show up in any tier 1 decks. However, I think you should still consider them. Torrent Elemental is only $1 and hasn’t seen play, but the synergy with both Delve and Eldrazi are their. It might show up in sideboards somewhere down the road in Sultai, UG, or UB decks. It’s also mythic rare which means it’s value can be more volatile. Icefall Regent also has the possibility of seeing more play through the various dragon decks currently in standard (Temur, Esper, and even Grixis). He went up a little bit before, but not much. It’s only $1.50 and a possibly 3-4 of in one of those Temur decks, but I only think it will see play once the metagame slows down a little bit and cards like Crackling Doom become less popular. Another card I’m speculating on now is Displacement Wave. It’s basically blue’s new Aetherspouts. It’s a great pseudo boardwipe for blue midrange decks playing lots of big top end creatures, and deals with permanents such as Quarantine Field or any of the planeswalkers as well. Seems like a cool sideboard card. Grab them at $.50 and save them for a rainy day. 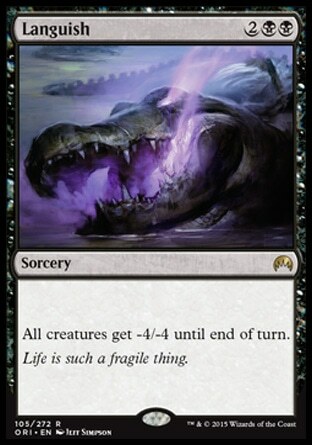 I expect Languish to be a popular sideboard card in the upcoming meta. It’s great against cards like Thunderbreak Regent and Mantis Rider in Jeskai, almost the entire GW megamorph deck, and even against a lot of the aggro decks out there. At $4 it’s a steal, especially with almost a year left to play it. I don’t know if it will show up as a 4 of in decks which could hamper growth, but I expect people grabbing 2-3 for sideboards over the next few months. I’m going to predict a $7 by the end of the season. 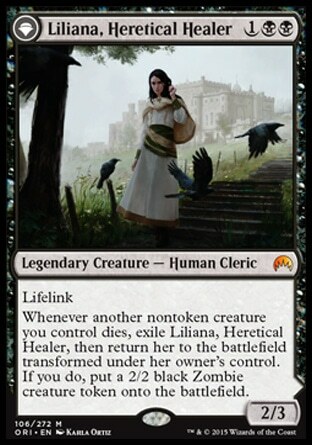 Liliana probably won’t end up being as commonplace as Jace, Vryn’s Prodigy has become, but I see steady growth for her over the next few months. At the moment her role in Artistocrat decks looks promising, and once modern rolls back around she could possibly play a bigger role in the Abzan company decks out there as well. Aside from Rally/Aristocrat decks, I think she might find a home in GB Elves/Rally Elves as well. $16.75 is the lowest I’ve seen her so far, but she could still go down another $1-2 if you still think she’s too expensive. I just wouldn’t wait too long cause she could find a break out deck soon. If you haven’t heard, Tasigur has been chosen to be a part of a wonderful event deck which has since pushed his price falling all the way to $5. This should make him incredibly affordable, and also it should make that even deck rather popular. If you look at how the DTK event deck lowered the prices of Collected Company and Windswepth Heath, then you can get an idea of what this printing will do. At the moment Tasigur’s value is largely being propped up by Legacy and Modern play, but once he starts showing up more in standard I expect his value to recover. Collected Company is still $20 in Japan, and Windswepth Heath has also recovered most of it’s lost value thanks to the popularity of Abzan and GW decks. He might get a little cheaper, but when he does jump on him. Grab a playset if you want. You’ll have to wait a little bit longer than before to make a profit, but he will see play for a long time across all formats. There aren’t too many big money cards in black right now, but I could see a few more cards making waves in black in the right conditions. For example, Bloodsoaked Champion ($2) could see more play at the casual constructed level in decks like Mardu Warriors (Tier 2), Grim Haruspex has been popping up in Rally/Aristocrat decks and might go up slightly from $.50, and Infinite Obliteration has been both in sideboards and the new WB Edlrazi Processor deck making the rounds on MTGO and other places. It’s $.75 in the USA right now, but its recent popularity here in Japan has pushed it’s price up to about $1.75 in some places. I’d grab a playset just to be on the safe side. This article is slightly longer than the past ones I did about previous sets, but I think 3 colors makes it a lot easier to post. It saves me a lot of time and lets me write about other things sooner without having to worry about publishing the entire series on time. So what did you think of my choices for White, Blue, and black? Right on the nose? Just off center? If you have any other opinions on which cards currently in standard (and not from BFZ) could see a price jump I’d like to hear from you. Lots of prices from KTK-DTK are dirt cheap now so we can end up making a nice chunk of money if we’re correct on our picks. Anyways, thanks for reading and putting up with my ranting. I look forward to writing the next article about Red, Green, and Artifacts. Be sure to check back after the pro-tour for my picks! Hi, this comment (sorry) is not about your post. I am not on twitter and thought this might be a good way to get through to you. I’m an ALT in Miyakojima, a small island south of Okinawa. There are a couple ALTs here that play mtg, one plays competitively, at least he went to Okinawa recently for a tourney which seems pretty serious to me. I enjoy card games and had been playing Hearthstone for a while. Mtg appeals to me for sure. I don’t think I could play competitively because I could not imagine buying new sets of cards every year or two just to be “legal” or “sanctioned” (I’m not sure what term is used to mean I can actually use those cards in matches). It makes me wonder about all those older sets of cards, what do you do with them? I know about legacy and stuff but also that it’s very expensive to get into. I would love to play for fun, and that would mean I would not want to have to worry so much about what set the card came from, unless it truly is just a card that is flat out banned. So, casual I guess. Also, I can imagine I would like to collect these cards. Who knows, one day I would also want to try tournaments. But maybe something like a pre-release thing where you get to keep the cards you open from the packs, so you don’t have to come prepared with a deck already. I have been watching old championship finals videos on youtube and enjoy them, so I’m learning about the game. Anyway, I’m getting off topic. My real question is, if I will begin to invest in buying cards, lets say even a duel deck set like Elspeth vs. Kiora, should I get it in Japanese or English? I speak and read enough Japanese that I could figure out the card text. Of course, personally I’d like the English more; I’m still new and don’t know the cards very well. But since I’m here in Japan, and hope to remain here even after JET, I wondered if the long term investment might be better in Japanese than English because my mtg playing friends here will be leaving and there is no one on the island I know of that plays mtg. In other words, if I ever decided to try to teach someone here how to play, they would most likely need Japanese because they would most likely be Japanese. On the other hand, I suppose serious Japanese players would not care what language they are in since they would know the text regardless. I guess I would like your thoughts on the matter since you live in Japan and play mtg. Does it matter what language? Perhaps not in tourneys. But what about starting up mtg for the first time? I have no cards of my own right now. Anything I buy will be my first. But once my friends leave, if I have English cards, I might not be able to explain the game well enough to, say, my students who love card games. Still, I wonder if the likelihood of playing mtg with a Japanese person is less than with an English speaker, even in Japan, in which case maybe English would be better. Hopefully you see the conflict in my mind. If so, I’d appreciate any of your thoughts. Thanks. If you’re more of a casual player then Pre-releases are a great way to play the game and meet people. However, if you’re looking for something to do with friends when you have a few free hours on the weekend there are a couple of things you can do for cheap. EDH/Commander is a format where you pick a legendary creature and build a 100 card deck with only one of each card. This type of format can be played any time with friends and lets you enjoy the game as well as work with building decks. Modern/Legacy are more expensive, but you can put together fun decks for relatively cheap just to get your foot in the door and learn the format (you’ll probably lose a lot at first). There is also Pauper, which uses on common cards, and Tiny Leaders too which is like EDH but with 50 cards and a 3 mana cost limit. It’s good to branch out and meet both local Japanese players and your fellow ALTs I think, just so you can always have somebody to play with. As for card language, most serious players know the cards in any language, but English should be fine. Since you’re a new player you should buy English until you’re used to all the cards in any given format. I hope this answers some of your questions, and if you have anymore feel free to ask!